The Foundation for Middle East Peace was established in 1979 by Merle Thorpe, Jr.. A brilliant, successful lawyer, Merle began critically engaging the complexities of U.S. policy towards Israel and the Palestinians after the dramatic sinking of the U.S.S. Liberty in 1967. In 1975, Merle’s commitment to Israeli-Palestinian issues took an important step forward when he took a trip to the region with his friend, colleague, and mentor, former Senator and chairman of the Senate Foreign Relations Committee William Fulbright. Combined with his troubling memory of the U.S.S. Liberty incident, this trip highlighted the imbalance of U.S. policy and media coverage of the conflict and sparked what would become Merle’s unceasing investment in the pursuit of peace between Israelis and Palestinians. Merle served as the director and sole principal of FMEP for 15 years, from 1979-1994. During that time, he created a bold grant-making program, brought dozens of Israeli and Palestinian speakers to the U.S., published several books on the conflict, and promoted a balanced analysis of current events related to Israel and the Palestinians. Merle’s vision continues to guide FMEP’s work today. 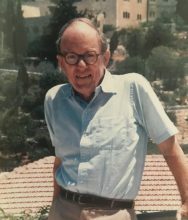 Merle was one of the first observers to highlight Israeli settlement activity as a central challenge to finding a resolution to the conflict. His analysis of Israel’s corrosive settlement policy was fully developed in his 1984 book, “Prescription for Conflict,” one of the first books solely devoted to the topic to be published in the U.S. 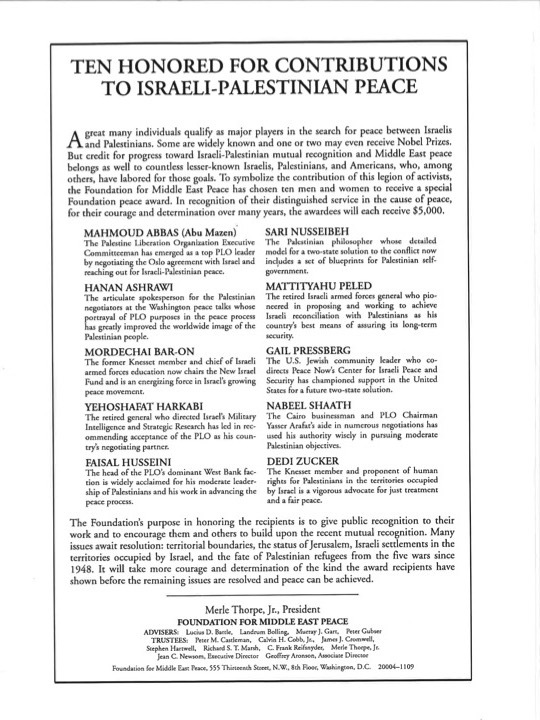 In 1992, Merle oversaw FMEP’s launch of the quarterly “Report on Israeli Settlement in Occupied Palestinian Territory” (archive available here). Merle was instrumental in the publication of several other books about the conflict by highly esteemed Palestinian, Israeli, and American scholars and activists, including Philip Klutznick, former Israeli major general Yehoshafat Harkabi, Sari Nusseibeh, and Mark Heller. Merle is known to have taken special pride in at least two “passion projects” while at the helm of FMEP. In 1988, Merle devoted himself to supporting a joint Israeli-Palestinian peace demonstration lead by Peace Now Israel and Faisal Husseini, a prominent Palestinian leader. At the demonstration, peace activists held hands to create an uninterrupted human circle around the Old City of Jerusalem, powerfully symbolizing that Jerusalem is for all. His last project was to complete the granting of special awards by the Foundation to those who had made great contributions for peace. This project was one he had long considered. It was great to see his determination to complete it, which he did. The New York Times, the Washington Post, and the Christian Science Monitor have all carried the Foundation’s announcement in the last couple of days. Ten individuals received awards of $5,000 each for their own special roles in pursuit of peace. And a lovely, diverse group it is – PLO representatives, Israeli ex-generals, long-time resident of the occupied West Bank and an American woman who has played a long-time role of significance. By any standards that might be set, Merle himself should have received a special award. He had traits we sought in others and found in few. We shall miss him. The greatest monument we can create to Merle is to continue his work, his quest for peace, and to hope he himself has now found it. In the weeks before his death, Merle wrote about some of his memorable achievements and a few disappointments in “Notes from a Bit Player in the Israeli-Palestinian Conflict.” This short memoir documents the seriousness and success of his work on behalf of peace. FMEP is honored to carry on Merle’s memory and legacy today.